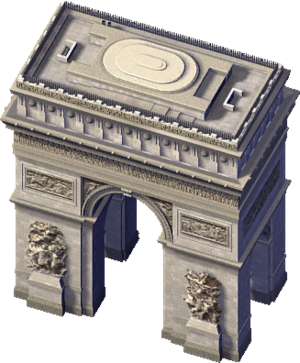 The Arc de Triomphe is a downloadable Landmark Building for SimCity 4 Rush Hour/Deluxe, released as the Plugin Pack 003 free Downloadable Content. It is a recreation of the Arc de Triomphe in Paris, France as it appeared in 2003. The News Ticker fluff entry created on its placement is "Arc de Triomphe: A Triumph For #city#". The Arc de Triomphe is almost unique amongst SC4 buildings in that it is impossible for it to catch fire, even with the fire tool, due to it having 0 Flammability. The only other buildings known to have this trait are Stonehenge and the Washington Monument. This page was last modified on 5 February 2014, at 23:32.